Although we all use computers in business today, many industries still generate large amounts of paper records – much of which has to be kept for long periods of time. 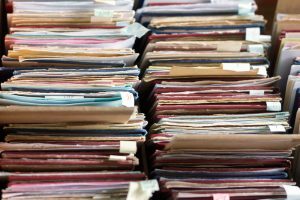 Financial, legal, insurance and medical records, as well as tax records, architectural drawings and project information – whatever your industry, you probably have a lot of files that you need to store. There’s no need to use your valuable office space, particularly if you’re paying premium city rates for every square foot. Self storage units offer you a cost-effective and secure place to keep your confidential and important documents. When you start looking for a self storage unit, don’t assume all operators have the same offer. It’s worth looking about to see what you need. While your first thought might be to look for the closest storage unit to your office, in fact this may be the least important consideration. Many industries need to store files for up to 10 years, but the paperwork is rarely needed during that time. Choosing a storage operator outside of the city limits will result in the benefit of lower costs that outweigh the distance to go for the occasional file. Some storage units are external lock ups, while others are indoor units. If you do choose an external lock up, you’ll need to be aware of potential damage to your files from damp and rodents. An indoor unit will mean that your paperwork stays dry and rodent free, so there’s no chance of mould or chewing to ruin essential files. Another advantage of indoor units is that you are not only relying on your padlock to keep your data secure. Check that the operator you are considering offers CCTV both inside and outside of the facility. Some facilities, like Cookes, are manned throughout the day and have PIN code access, providing another layer of reassurance. The great thing about self storage is that not only are the contracts flexible, so is the space. So, as your business grows and your records increase, you can easily expand the size of your unit. If you do need to access your records, you’ll want to be able to get hold of them easily. You can be sure that if you just pile boxes on top of each other, the files you need will be at the bottom of the heap. Adding shelving to your unit will allow you to easily access individual files, and means boxes won’t get crushed and damaged. At Cookes, our archive units are prepared for you with pre-installed racking – giving you one less thing to do. Make sure you clearly label each box before it goes off to storage. Whether you mark them by year, by project name or some other system, number each box and set up a simple record system on your computer. Then, if you do need to retrieve a file, you can easily identify the right box. Once your boxes are full, you’ll need to get them to your unit. Paperwork can be surprisingly heavy and inconvenient to move about. We have a simple solution – our removals team will collect your boxes for you, and move them into your unit, secure and stored until you need them. With the deadline for GDPR compliance coming in May 2018, firms are reviewing their data storage right now. No matter where you store your confidential files, the onus is on your business to keep them safe. Make sure the storage firm you use has a clear understanding of GDPR, and how they can help you keep your files secure. 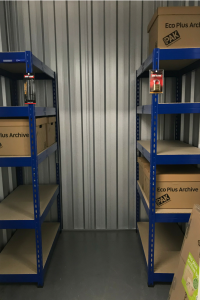 At Cookes we have a ready make archiving solution for businesses, including pre-installed racking in your unit, a supply of extra strong archiving boxes, a padlock and marker pens, and an LED light to help you find your way. Once you’ve packed your boxes, our removal team will collect them for you and install them in your unit. Call Cookes – we’re here to help your business grow.